"Whosoever dies clothed in this shall never suffer eternal fire." "Wear it devoutly and perserveringly," she says to each soul, "it is my garment. To be clothed in it means you are continually thinking of me, and I in turn, am always thinking of you and helping you to secure eternal life." The blessed Virgin of Mt. 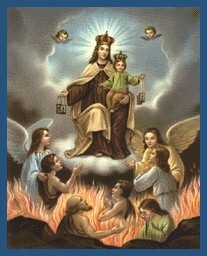 Carmel promised those who wear the scapular devoutly and with the proper intentions would not suffer the fires of Hell; also, their stay in Purgatory will be shortened if they should pass from this world still owing some temporal debt of punishment. Tradition recounts when the Blessed Virgin appeared to St. Simon Stock she said of those who wear the Brown Scapular, "I, the Mother of grace, shall descend on the Saturday after their death and whomsoever I shall find in Purgatory, I shall free, so that I may lead them to the holy mountain of life everlasting." Pope Benedict XV, so anxious and determined to make it very clear to all that the medal was positively never meant to replace the brown cloth Scapular (except in extreme cases) declared on July 8, 1916: "'In order that one may see that it is Our desire that the Brown Scapular be worn we concede to it a grace the Scapular Medal shall not enjoy.' And the pontiff proceeded to grant an indulgence* of 500 days for each time the cloth Scapular is kissed". On July 16th, the Scapular feast, while addressing the seminarians of Rome, Benedict XV said: "Let all of you have a common language and a common armor: the language, the sentences of the Gospel; the common armor, the Scapular of the Virgin of Carmel, which you all ought to wear and which enjoys the singular privilege of protection even after death." At Fatima, on October 13, 1917, Our Lady performed the great miracle of the sun. 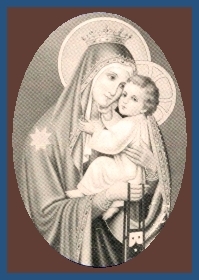 Our Lady of Mount Carmel with the Brown Scapular. The very fact that she was holding the brown scapular tells us that she wants us to take it and use it!
" `It is permitted to the Carmelite Fathers to preach that the Christian people may piously believe in the help which the souls of brothers and members, who have departed this life in charity, have worn throughout life the scapular, have ever observed chastity, have recited the Little Hours [of the Blessed Virgin], or, if they cannot read, have observed the fast days of the Church, and have abstained from flesh meat on Wednesdays and Saturdays (except when Christmas falls on such days), may derive after death—especially on Saturdays, the day consecrated by the Church to the Blessed Virgin—through the unceasing intercession of Mary, her pious petitions, her merits, and her special protection.' "
With this explanation and interpretation, the Sabbatine privilege no longer presents any difficulties, and Benedict XIV adds his desire that the faithful should rely on it (Opera omnia, IX, Venice, 1767, pp. 197 sqq.). Even apart from the Bull and the tradition or legend concerning the apparition and promise of the Mother of God the interpretation of the Decree cannot be contested. The Sabbatine privilege thus consists essentially in the early liberation from purgatory through the special intercession and petition of Mary, which she graciously exercises in favor of her devoted servants preferentially—as we may assume—on the day consecrated to her, Saturday. Furthermore, the conditions for the gaining of the privilege are of such a kind as justify a special trust in the assistance of Mary. It is especially required of all who wish to share in the privilege that they faithfully preserve their chastity, and recite devoutly each day the Little Hours of the Blessed Virgin. However, all those who are bound to read their Breviary, fulfil the obligation of reciting the Little Hours by reading their Office. Persons who cannot read must (instead of reciting the Little Hours) observe all the fasts prescribed by the Church as they are kept in their home diocese or place of residence, and must in addition abstain from flesh meat on all Wednesdays and Saturdays of the year, except when Christmas falls on one of these days. The obligation to read the Little Hours and to abstain from flesh meat on Wednesday and Saturday may on important grounds be changed for other pious works: the faculty to sanction this change was granted to all confessors by Leo XIII in the Decree of the Congregation of Indulgences of 11 (14) June, 1901. • RECITE DAILY THE "LITTLE OFFICE OF THE BLESSED VIRGIN." A) TO OBSERVE THE FASTS OF THE CHURCH TOGETHER WITH ABSTAINING FROM FLESH MEAT ON BOTH WEDNESDAY'S AND SATURDAY'S. B) WITH PERMISSION OF A PRIEST TO PRAY FIVE DECADES OF OUR LADY'S MOST HOLY ROSARY. C) WITH THE PERMISSION OF A PRIEST TO SUBSTITUTE SOME OTHER GOOD WORK.